GOAL: To design, build and program a line following robot that can follow a black line on a white background to a tower and deliver at first, at least one ball and then return to its starting point. Then in the remaining time to return to the tower (as many times as needed) to deliver a set number (no over, not under) of balls as per their division’s requirements. ROBOT: Volume of the robot must not exceed 65030 cm3, multiple sensors and processors are allowed. TRACK: The track is a white rectangle with a black line. The width of the black line and the number of intersections on the route depend on the division. The tower is a cuboid made of cardboard with dimensions of 35 x 10 x 20 cm with a 10 x 10 cm opening at the top. 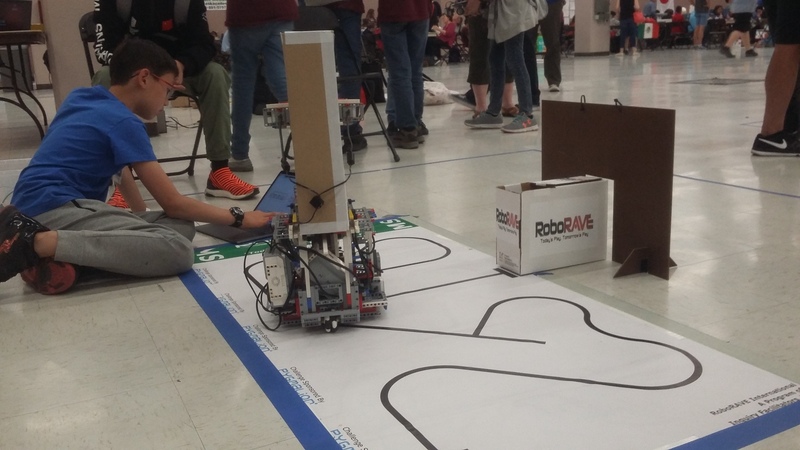 TIME LIMIT: The robot has 3 minutes to complete the task.